← Hurry up…. and wait…..
Yup, Im tearful again…. but not for the reasons that you think…. This time it is a joy so deep and so total that it has brought tears to my eyes. I want you to go back, back with me to a time a few months ago when I wrote my blog entry “Twinkle, Twinkle, little star..” . If you haven’t read it, then please go do so now if you have time, if not I will tell you it was by far the hardest thing I have ever written. It was about a misunderstanding of epic proportions that was caused both by a language barrier and by humanness. Estuardo was my boy. My figurehead… he, for me, encompassed everything “Guatemala”. He was the first boy I met at the Hospital and he changed my life forever. He was so severely malnourished that his 17 year old body looked like that of an 8 year old, he was mentally challenged and unable to move, communicate etc etc. All he could do was stare at the time I met him. He shattered my heart. He became a symbol to me of everything that was wrong and broken in this world. And after being back in Canada for several months and not hearing any news on him, we returned to Guatemala. I was thrilled to be back and looking forward to seeing “my boy”…. But my boy was “home”…. Home is quite the word…. it means different things, in different contexts. This time it meant quite simply, as Mario put it…. dead. The pain was intense, severe and overwhelming for me. But looking back upon old journals, videos and my blog I know that “home” means quite simply…. ‘with Jesus’. That IS the Good News! The day I learned of Estuardo’s passing, my family and Rachel (a beautiful, then 15yr old girl from the youth group I lead) met another incredible young boy by the name of Marcos Cruz Cruz, nicknamed Marquito (little Marcos). This boy touched us all but especially Rachel. It was an emotional day for us all… I was crying with sorrow over Estuardo and we saw this little body in a crib. The sight of Marquito is shocking to say the least. I am putting a picture at the end of this post, but I must warn you, it is not easy to look at. But I feel I need you to see with your own eyes… so you can understand with your heart. Marquito captured our hearts…. but especially the heart of that amazing 15year old girl, Rachel…. Marquito is Rachel’s, Estuardo. We all have an “Estuardo”… whether it be in Guatemala or Canada, or anywhere…. You know, the one person that touches us so deeply inside of ourselves that it basically turns our world upside down. Some people have been fortunate enough to meet their Estuardo… some are still looking…. I feel very blessed to have found mine and sometimes when I get down or overwhelmed by things I can almost feel him cheering me on from Heaven! Upon returning home, Rachel immediately went into action trying to raise money for a series of major operations that Marquito is in desperate need of. You see, he is blind, has a very severe case of cleft palate and a myriad of internal problems. She began selling homemade wallets and then decided to have a fundraiser, instead of a sweet 16 birthday party! 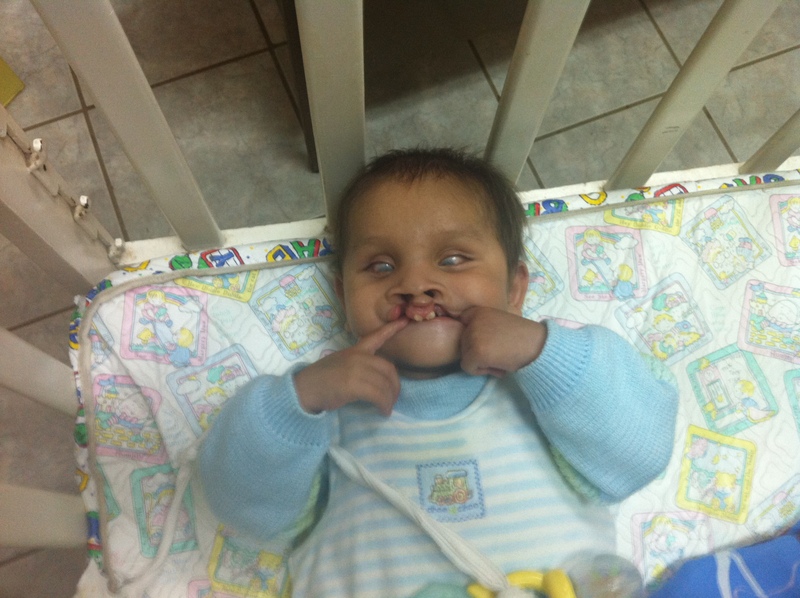 No gifts, just money raised for this precious 3yr old boy (who looks perhaps 9 months old), halfway across the world. The rest of my youth group girls rallied around Rachel and her cause, as did the rest of the youth from our Church. It was a beautiful thing to watch unfold and I have to say I am so proud of my girls, quite frankly they rock and I am so honoured to be their leader. Rachel raised over $2000.00 toward the operations! And was ready to wire the money immediately, but I hadn’t heard news from Guatemala yet on his condition so I called. Fernando translating for me broke the news from Hermana Mercedes as gently as he could…. Marquito was gravely ill. And the doctors were continuing to assess the worth and chance for success on Marquito. No operations right now. I prepared myself to tell Rachel…. The reality of serving at a malnutrition hospital in Guatemala is they rehabilitate children… but sometimes the children are too far gone to be rehabilitated and they die. Our humanity mourns for them but we continue to move forward. I once a few months ago had someone remark to me after seeing pictures of Marquito, “You are seriously going to raise money and spend it on him? If I donate, my money will go to that? Why? He has no shot at a normal life. Not to sound brutal but wouldn’t the money be better spent on someone with a better chance at a future?” Im not sure if that is a common question…. or maybe its a common ‘thought’, that one feels so shameful thinking that its not often expressed. Believe me, I understand that question. My answer is simply, yes, we are going to spend the money on this child, and every other child like him that is put before us. God made Marquito, and he is beautiful because of God. It is not for us to decide whether his purpose on this earth is less worthy than that of another child. Marquito laughs, cry’s and feels just like every other person on this planet. What if this was your child? Would you ask the same question? He is a shining star, still on this earth just like Estuardo is a shining star now in Heaven and we are going to do what God commissioned us to do, help. End of story! The bottom line is that after months of praying, hoping, wishing and praying more we got a special letter from Hermana Mercedes last night that has me all teary, ever since reading it…. It’s about Marquito’s condition…. He is on medication right now to prepare him for his first surgery!!!! Praise God, its going to happen… He is going to get the surgeries he needs. The outcome is unknown, as is Marquito’s future… that is up to God…. whats up to us, our partners, and the people who inhabit this planet is to see that we give the Marquito’s, Estuardo’s, and all the others like them the same chance as we have to shine. This is where the money we raise goes, every penny, and we will never apologize for that, in fact we will shout it from the rooftops if we think it can help save one little precious child….. Who know’s what their purpose is on this planet… it’s not for us to say, and its certainly not for us to pick and choose who we help… All we do is help and for us its a big part of the Good News! Posted on June 28, 2011, in Guatemala Missionary, Uncategorized and tagged Guatemala, Malnutrition, Missionary, Volunteers, Youth. Bookmark the permalink. 1 Comment. Thanks so much for your heart-felt blog entry. My “boy” , among other children in Guatemala, was Rafael, a baby boy at the malnutrition center whom I thought was about 10 months old, but was over three years old. Because of lack of nutrition when he was a baby and most likely of his Mom when she was pregnant with him, he had many problems, but after several months of care, good hygiene, proper nutrition, and lots of love and care at the center, he began to flourish beyond all expectation. You are quite right when you say that each of these children is precious, to us and in the sight of God. Once you have seen, how can you forget?